This past weekend at the Sherwood Forest Renaissance Faire, two leading figures from two very different schools of competitive jousting – Charlie Andrews and Steve Hemphill – met in the tilt yard for the first time. Charlie Andrews, from the tv show "Knights of Mayhem", is best known for his promotion of the blunt force style of jousting he calls “Full Contact Jousting” where opponents try to unhorse one another by using a solid wood lance to strike a specialized piece of shoulder armor called a gridded grand guard. Although skill is definitely necessary in this style of jousting, the size and strength of the competitors are, in some ways, more important. Also, historical accuracy is not as important as hard-hitting action, and injuries are an expected part of the competition. Steve Hemphill is the producer (and 2011 winner of the Joust a'Plaisance) of “Lysts on the Lake”, the largest competitive jousting tournament (in terms of number of competitors) in the world today according to the International Jousting League. 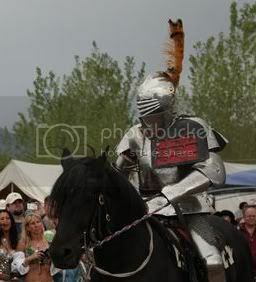 His precision oriented style of jousting is based on the historical Joust a'Plaisance(joust of peace), in which opponents scored points for breaking their lances on their opponent's ecranche (a small shield covering the left shoulder). Since an injured knight became a liability rather than an asset, this style of joust was designed to demonstrate a knight's precision and control of the lance with minimized risk to the competitors. The lances were designed with frangible(relatively easy to break) wood forming at least part of the lance. These frangible lances would break dramatically upon direct impact against the opponent's ecranche. Unhorsing your opponent was not intended – though it still occasionally occurred. Although the risk of injury is reduced using the Joust a'Plaisance style, it is not entirely eliminated, as demonstrated by the injuries to England's King Henry VIII and the death of France's King Henry II during jousting tournaments. Although Charlie and Steve generally compete in different styles of jousting, the two put aside their differences in order to compete directly with each other for the first, but probably not the last, time. Steve Hemphill was kind enough to answer a few questions about his experiences jousting against Charlie Andrews. When you first heard of Charlie Andrews and the style of jousting that he does, what did you think of him and his style of jousting? Steve: My first exposure to Charlie was in the New York Times article “Is Jousting the Next Extreme Sport” in the summer of 2010. 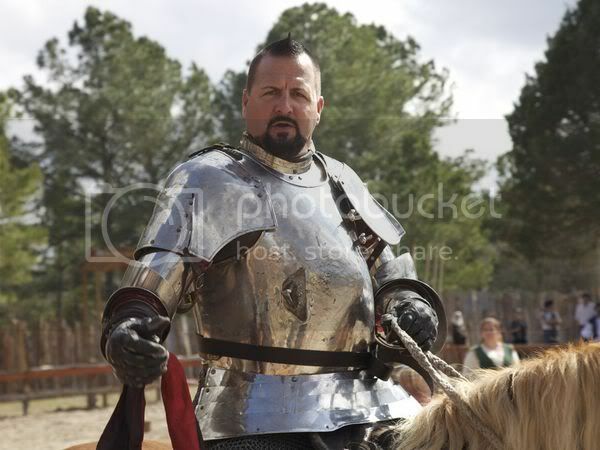 The article further emphasized the division in the competitive jousting community by labeling the “American” style jousters as “as a bunch of ego-driven braggarts who have substituted brute force for safety” and the “European” style as being “froufrou and weak” and “a sorority pillow fight.” I’m a historical jouster that enjoys the “European” style so I, understandably, had a strong opinion of how Charlie was portrayed in that article. However, a few months later, I had the chance to meet Charlie at the “Tournament of the Phoenix” in Poway, CA. and saw that he was considerably different than what I had assumed from the article. Over the next year or so he and I had some strong words on the various internet boards about our very different approaches to the sport. 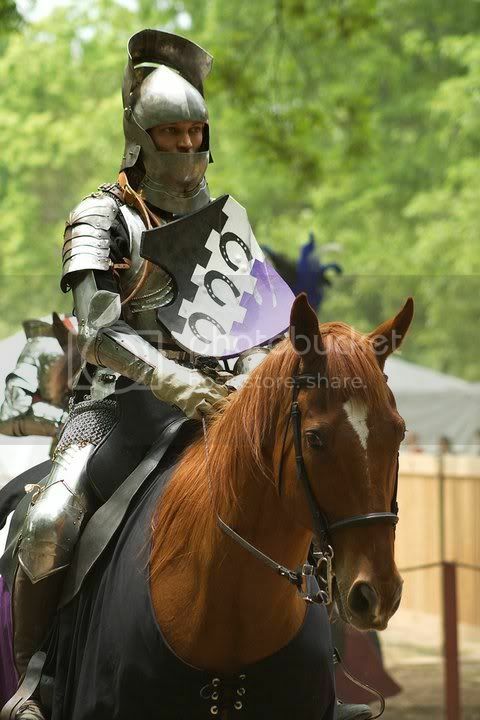 Now that you have met Charlie Andrews and jousted against him, what do you think of him and his style of jousting? Steve: I produce events for a living and also as the producer of the “Lysts on the Lake”, I’ve been primarily interested in seeing the sport grow with a modern audience since 2005. Because Charlie and I have the same goals (but very different approaches), I decided it might be worth our while to put aside our differences and embrace the many ideals that we actually shared. We had a long talk at the Texas Renaissance Festival in Nov. of 2011 and, for all intents and purposes, put aside our differences and have concentrated on how both of our strengths can help progress the sport. Charlie has always presented the challenge to the jousting community that he would joust anyone, anywhere, any time and any style, so I took him up on it. Due to the inherent danger of the sport, jousters want to only joust against skilled opponents. I’ve watched Charlie for about 18 months and he certainly is a skilled jouster so I looked forward to crossing lances with him someday. With his involvement with Sherwood Forest Faire (near Austin Texas), I finally had the opportunity to do so. He invited me, I accepted and we crossed lances, in my style, and I had a fantastic time. So much so that not only will I be jousting at Sherwood again over the run of the faire but an in the process of bring some of my jousting friends to participate as well. Charlie and his crew (Becca, DJ, Brian, Eddy and Federico) were not only accommodating and inviting but quite honourable and helpful all weekend long. I look forward to playing with them again. What style of jousting did you use for your match and why? Steve: We jousted in my style with my lances. Although he did retain his grand guard (16th c.) and I my ecranche (15th c.). 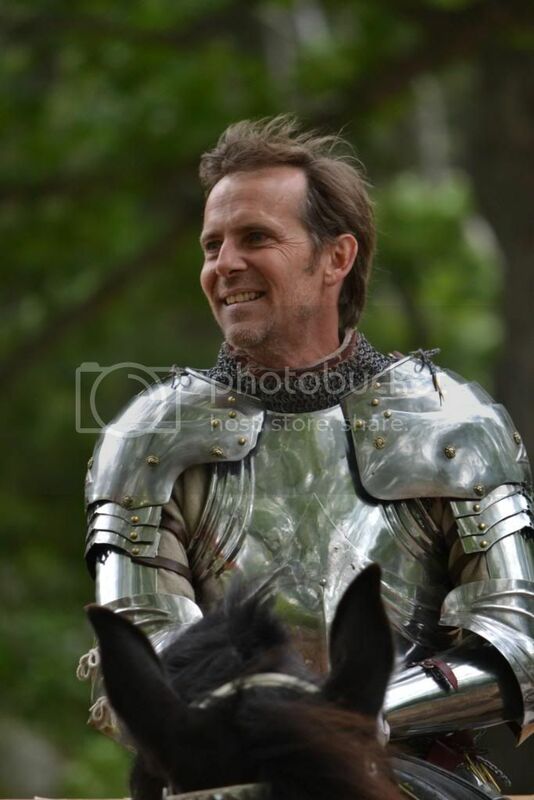 You would not have seen this type of matchup in a historical context as my armour is about 60 years older than his….but it was fun, none the less. How do you feel the competition went? Steve: Wonderfully! Charlie can consistently put lance on target time after time which is what you want in this sport. At no point did I ever feel that I or my horse were in danger. Steve: The audience….from the sound of their cheers, we gave them a wonderful show! I would also say that, because we earned one another’s respect, that Charlie and I won as well. If given the chance, would you joust against Charlie again? Steve: Certainly! We’ll do it again this weekend!